The Inkwell » Varner comes out, guns blazing, with new book! Varner comes out, guns blazing, with new book! To see evidence that Abilene Christian University faculty members are hard at work, you need look no further than the list of books recently released by ACU authors. Among them is a title by Dr. Paul Varner, scholar in residence and visiting professor of English. 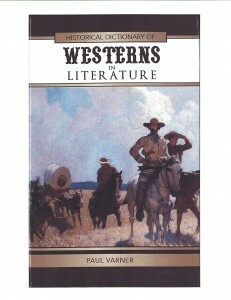 Varner’s latest book, Historical Dictionary of Westerns in Literature, was released on Oct. 15. Since coming to ACU in 2007, Varner has written three books on the literature of the American West. The books provide the latest information on scholarship, scholarly approaches, critical terminology, and essential information for scholars pursuing serious literary and cultural study of Western literature and critical analysis for the essential authors and novels of the West. “I have always wanted to work with the literature of the American West because of its impact on who we are in Texas and Abilene,” says Varner. “Western literature has both shaped our culture and reflected what our immediate culture has been.” For more information on Historical Dictionary of Westerns in Literature, visit the Scarecrow Press website.